Loved this film so much. Saw it on TV first and then again on the huge screen at the Virginia Theater at Ebertfest this year with Koganada giving a discussion afterward. I can't think of a better acted film recently; Cho, Richardson, Posey and Forbes are all so good. That's on top of Kogonada and crew's amazing compositions which I could just look at with the sound off. I can't wait to see what he's doing next. I hadn’t heard of the director, John Cho had mentioned it in an interview so thought I would check it out, and was wondering how it was so beautifully shot! Kogonada, incidentally, is (was?) a relatively well-known video essayist, a sort of more artsy Tony Zhou. I especially liked his video essay What is Neorealism?, and his essay and accompanying article on Hirokazu Koreeda, which features the best explanation I've ever read of the draw of 'boring' directors like Ozu, Yang, and Koreeda: "I grew up on a steady diet of movies that made everyday life seem less and less interesting. But along the way, I encountered films that offered a different sensibility. I found that when I left the cinema after watching these films, everyday life didn’t seem more dreary or bland, but more meaningful and savoury. In a way, these films helped restore my taste for the everyday." 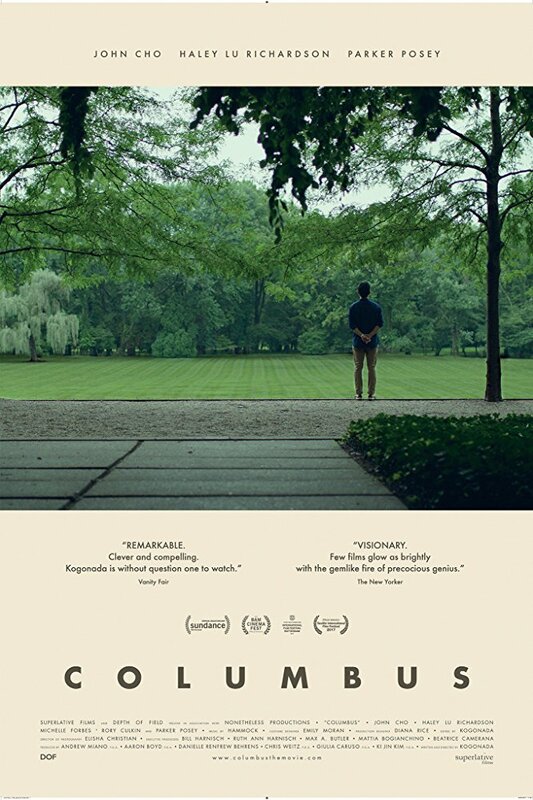 I first encountered Kogonada through some of his video essays that he did for the Criterion Collection, so I was interested in seeing COLUMBUS when I found out that he was doing a narrative feature. Seeing the trailer, I was instantly primed. As someone who majored in Art History, the background framework was a hook if I ever saw one. Surprisingly, I never heard of Columbus the place prior to the film. One of my courses was 20th Century Architecture, so I was very familiar with the people whose edifices set the stage. I was utterly blown away by this film. It collects this quiet austere beauty that creeps up on you, and Haley Lu Richardson's performance is something I have trouble coming up with appropriate adjectives for because she disarms and challenges in the same breath, and her chemistry with John Cho was great, and I appreciated how the film never went into expected territory. Add in the legendary work of both Parker Posey and Michelle Forbes and you have it. I just loved how the film made a topic as potentially cold and alienating to general audiences as mid-century architecture and re-imbued it with an awe and emotional majesty that resonated with the somewhat lost souls of Casey and Jin. The scene of Casey showing Jin the bank is one of my favorites, and the decision to move the camera inside the building as Casey is ditching the canned talking points is inspired. You are left to look at and admire the gentle precision of Richardson's facial expressions and the small ballet of her gestures. It's such a beautiful lovely lovely film. I adore it.